Using only small-scale floral designs can make a space look cluttered and busy, mix your pattern sizes and try using smaller floral designs on the bigger pieces. Also be careful of too much repetition i.e. 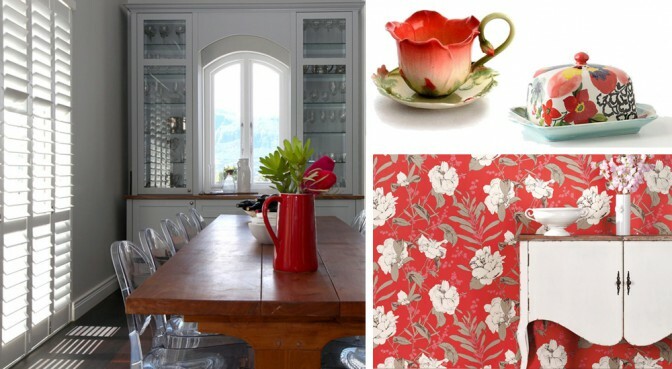 using the same floral pattern on too many items in a single room, as it can look contrived and overdone. 1. Mix floral pattern sizes and styles for an interesting layered look. For a modern bold look, use bright colours instead of the soft muted floral tones of the past. By incorporating blocks of solid colour into the decor scheme, you can tie in various patterns and ground the space. Combining colours of the opposite side of the colour wheel such as red and green or blue and yellow (as shown above) will create a bold effect and real drama. But for the colour-shy perhaps tone these combinations down by using a lighter shade or tone of one of the colours or using one colour as an accent colour only. If bold colours scare you then using only one colour with white is advisable. This allows you to easily incorporate a mix of patterns such as geometrics, stripes and florals. The overall effect is quite elegant and sophisticated as demonstrated in the below image. 2. The strong geometry of shutters complements floral design beautifully. While mixing patterns and colours can make a space interesting and unique, be warned to not mix too many design styles. 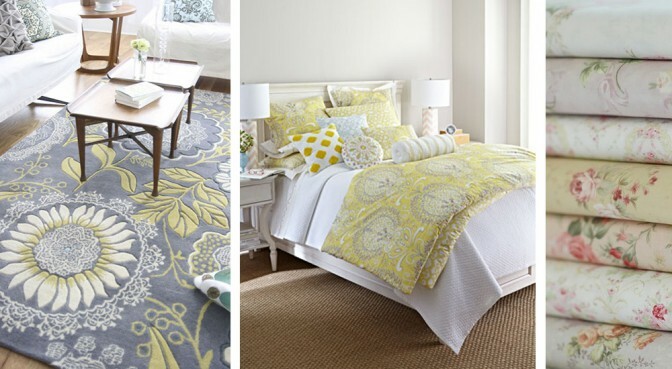 Choose the right style of floral design to incorporate into your space i.e. country floral fabrics may not work in a modern minimalist apartment and Asian-inspired floral prints will not look good in a coastal home and art deco prints would be out of place in a traditionally decorated room. 3. 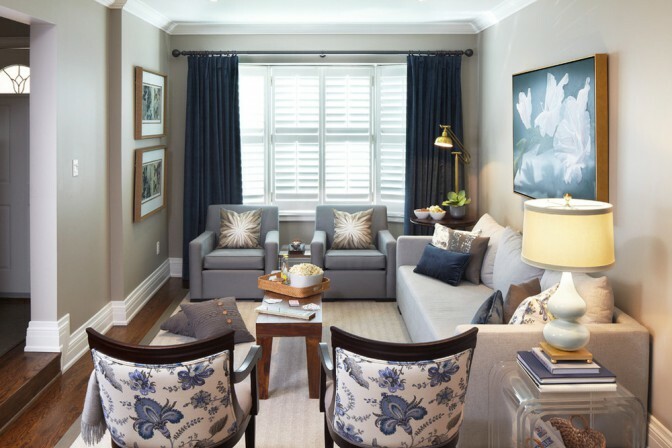 Be sure to build on your chosen decor style when adding floral patterns and elements into a space. Add vintage floral elements and patterns to create a sense of nostalgia. Successfully mixing old and new takes skill; you cannot simply collect various items from various eras and expect them to work together. Using too many old pieces and patterns can make a room look dated and more like a museum than an inviting comfortable home. 4. 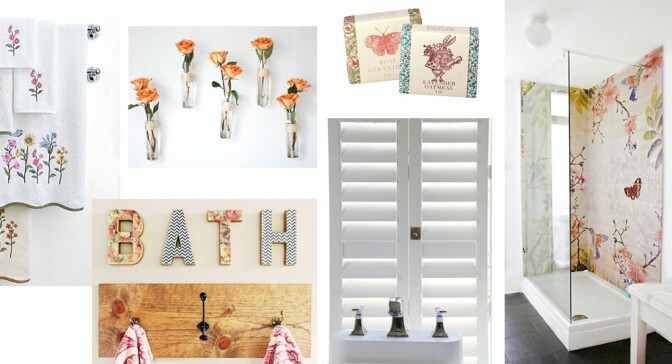 AMERICAN shutters’ Woodbury shutters are ideal for use in bathrooms and kitchens and they complement any decor style. 5. Shutters open and close easily to allow in natural light and all the scents and sounds of spring.